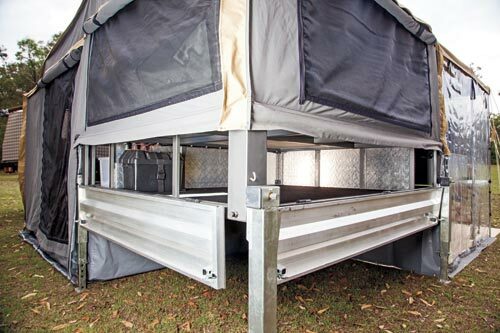 Impact Tray Campers have a basic design that comes in a 1.75m (6ft) form for dual cabs, a 2m (7ft) form for space cabs, or a 2.2m (8ft) form for single cabs. All are essentially the same, with only the length of the floor (and thus width of the tent) varying. 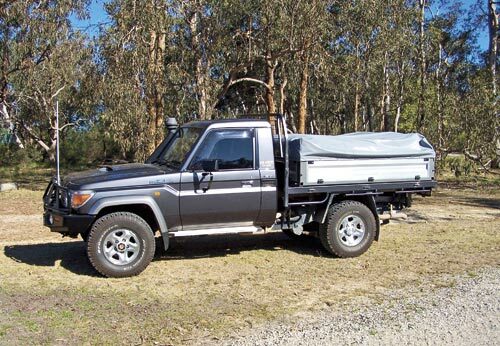 This, of course, doesn’t mean you have to fit a longer 2.2m tent to your single cab pick-up, as many opt to fit the smaller 1.75m dual cab tent leaving them with 600mm of tray space to carry things such as a trail bike, fridges, jerry cans or whatever else they might need. Likewise you could fit a space cab 2m tent and have 400mm free. The larger versions come with a near king-sized bed in an east-west format with the 1.75m model having the same bed in a north-south layout courtesy of a flip-over hinged extension of the bed base. You can have the desired north-south form on any model as an option, to avoid having to climb over your partner in the night. Bed access is via a supplied set of steps. Beneath the bed is a 340mm deep carpeted storage space that’s subdivided into food/clothes and general storage. 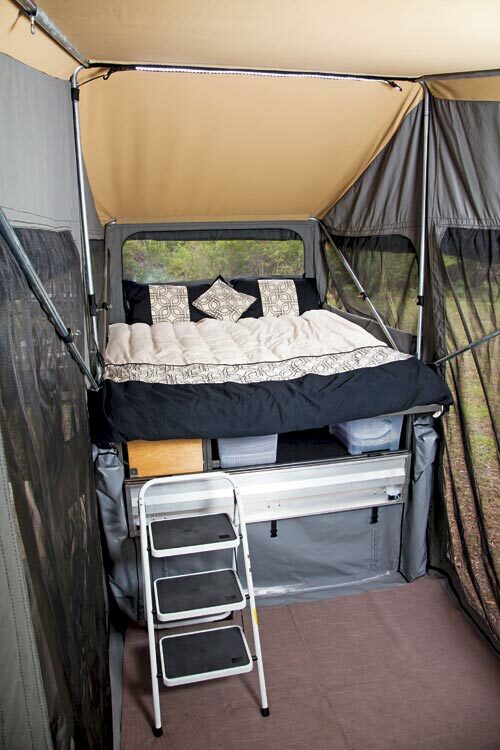 All sides of the camper fold down to access these spaces. P-seals are used all round and so far, Mr Ahyee reports, there’s been no experience of dust or water getting in. 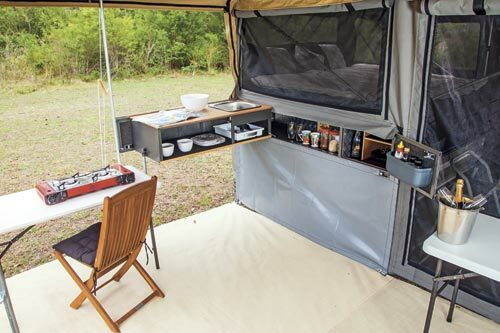 The camper unit is built on an RHS steel frame, TIG welded to aviation standards, with 2mm aluminium floor, 3mm aluminium sides and all within 1mm tolerances. The end result is a very rigid structure that allows you to wind up one leg clear of the ground and have no drooping at all. 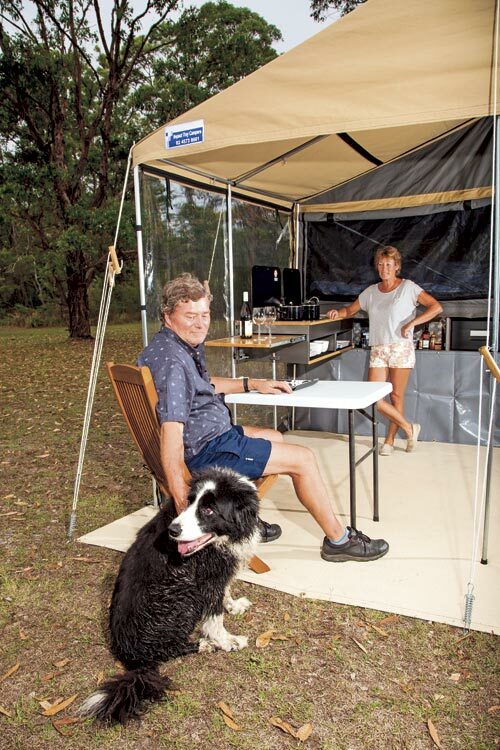 The camper was designed to operate as a “base camp” offloaded from the vehicle, so the Manutec corner jacks have been modified to give a maximum lift of 1350mm and a closed extension of 650mm, which allows the bed and kitchen to be low enough for easy access and use. The whole set-up is extremely stable, requiring no cross-bracing or other supports. The tents are all Australian canvas courtesy of Bell Canvas’ skilled sewers. 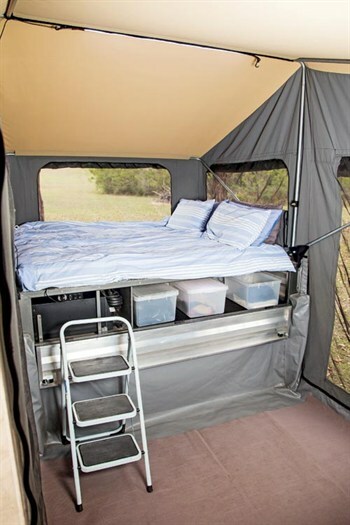 The default size is a 3m coverage out from the bed with a zip-out floor, but a 3.7m version is optional. There are three large screened windows around the bed and three in the general tent area, each with indoor and outdoor roll-up covers, plus a doorway on the awning side with zip-down screens and doors. 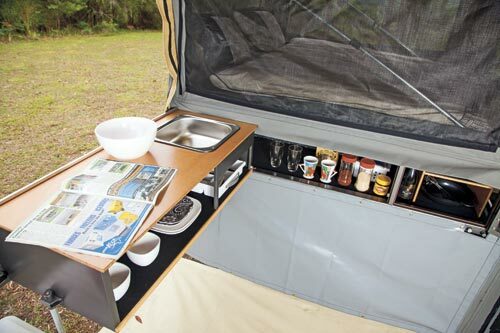 Down the kitchen side of the camper is a 2400X4800mm awning. Flooring and a skirt to go beneath the kitchen are supplied, and screen/canvas walls or a tropical roof are optional. Another option is a clear wall to provide light at the end adjacent to the kitchen. Additional awnings/annex can be added to the other side of the camper. The awning can remain attached during pack-up for ease of set-up at the next camp. There’s plenty of room on top of the bed, beneath the vinyl cover, to carry chairs, tables or other items. If you have kids there is an option of skirt sides to go all around the base and a floor, so the kids can sleep under the camper body. Alternatively you could just get the extra skirts and use the under-floor space as an out-of-sight storage area while you are away from camp. The tent is a little heavy for one person to lift off the base during set-up. The kitchen swings out under the awning and has a basic 500x1130mm ply top with a stainless steel sink over an open carpeted storage space. 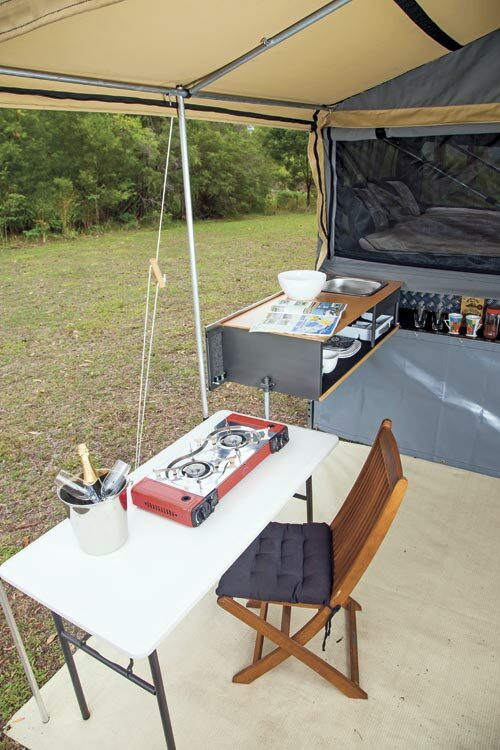 You provide your own camp cooker to sit on the end of the bench or an adjoining table. However, the upmarket model is more desirable. Essentially it is basic, looks great and doesn’t have the cost or weight of stainless. It is a painted steel frame, as per the basic unit, but has a classy oiled solid pine top with a three-burner Smev stove and stainless sink, which includes a mixed tap and simple open space storage underneath. At the outer end is a slide out 600x450mm bench extension. The mixer tap comes into use if you go for the hot water service option (external gas unit can be attached). 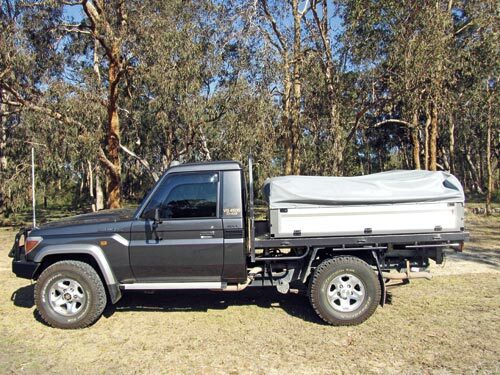 The basic camper does not come with water, though you can have a 53L tank installed as an option. However, Mr Ahyee recommends under-vehicle tanks or two 40L side tanks which mount under the rear corners of the vehicle tray as being more versatile. Water supply is then a matter of connecting these to a pick-up point under the kitchen. Gas is likewise supplied from whatever bottle you want to carry connected to a bayonet fitting beneath the stove. One of the neatest features we saw here was the new Waeco drawer fridge. At 30L they are a bit small, but it slots right in next to the kitchen, and if you want a second you can place it in the main body of the camper. If you can’t afford it up front, the basic camper comes with the mounting points and fittings for the wiring so you can install one later. The basic camper comes without electrics, in case you want to do it yourself, but you can have one or two batteries up to 110Ah with three electrical circuits: one for the kitchen, fridge and associated storage box, and two for power and light sockets for the interior. There’s a hard wired LED light strip in the tent ceiling and the internal clothes storage/kitchen areas. Charging is via an Anderson plug or a solar panel (not included). Chris Ahyee has developed a light (350-380kg, depending on fit-out), slide-on camper with a low packed height for stability and ease of travelling. 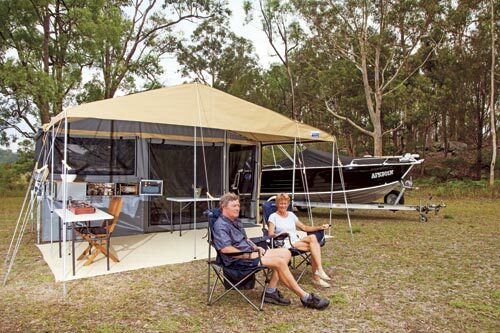 It offers all of the basics and, if desired, most of the comforts of any other camper at a very manageable price. The base unit is $12,600 and optioned up it’s $16,000 to $17,000. Its layout is very flexible and extendable, it’s light, roomy and as well-equipped as you want to make it. 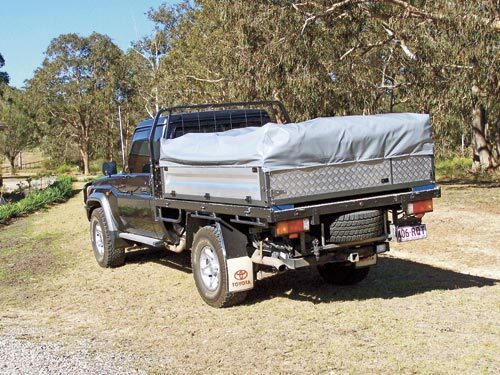 Like all good slide-ons you can drop it onto a trailer – it fits directly on top of a standard 7x4ft box trailer – and you have a camper trailer. 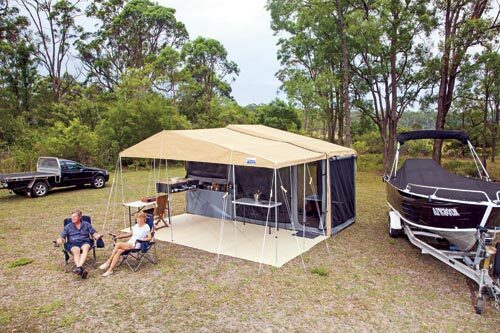 It’s only available direct from Impact Tray Campers, as adding agencies pushes up the price. It gets a big thumbs-up from us. 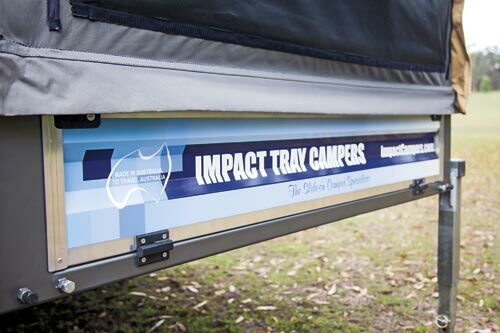 Find new Impact slide-on campers for sale. Find used slide-on campers for sale.